Introducing the new MWR online leisure travel program, the American Forces Travel site! 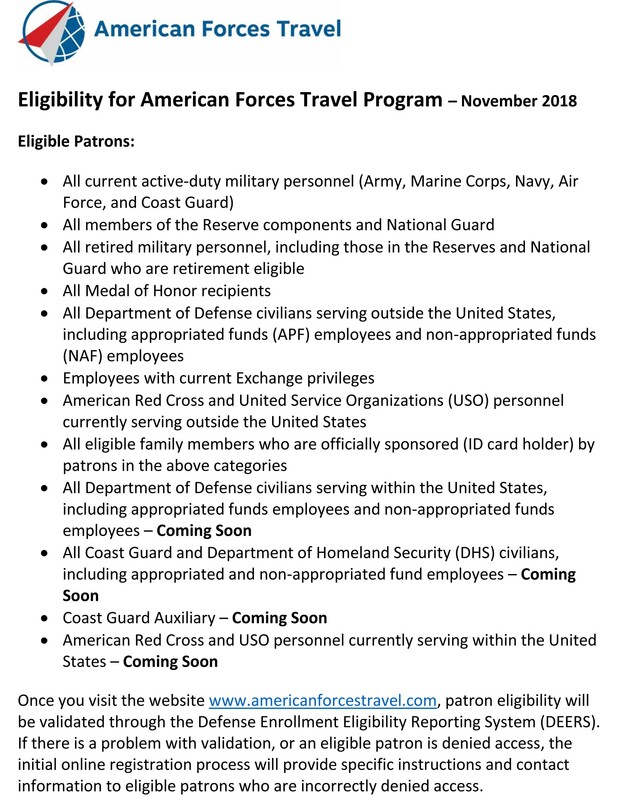 The American Forces Travel site will include a wide range of discounted, leisure travel offerings including flights, hotels, rental cars, travel packages and cruises. Additional services include tours, excursions, restaurant reservations, and concert and sporting tickets, which are expected to be added at a later date. This new and easy online, user-friendly tool managed by Priceline will enable installations and customers to obtain travel products and services at best available prices regardless of where they live and work. Currently, all active-duty military, retirees, Reserve and National Guard, retired military, OCONUS civilians and eligible family members are eligible to participate. The program directors are working to include CONUS civilians and veterans. Click here to check Eligibility Requirements. Once you go to the website, patron eligibility will be validated through the Defense Enrollment Eligibility Reporting System (DEERS). If there is a problem with validation, or an eligible patron is denied access, the initial online registration process will provide specific instructions and contact information to eligible patrons who are incorrectly denied access. There will be 24/7 travel agent support for customers during the booking process and continued support during the customer travel process in case problems arise with reservations during the trip. Copyright © 2019 | USCG Base Cape Cod MWR | All rights reserved.